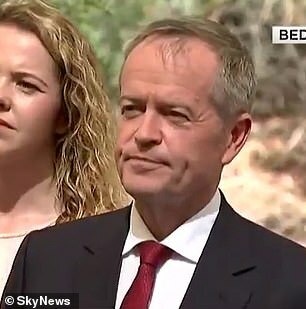 Bill Shorten has had a tense exchange with a reporter on the campaign trail who asked him about Labor’s emission reduction target. ‘When can voters expect to learn more about Labor’s emission reduction target, how you’re going to get there and the cost to the economy?’ Lea asked. Lea said Mr Shorten’s reply to Prime Minister Scott Morrison’s budget was ‘focused exclusively on health’, a claim Mr Shorten took exception to. ‘First of all I haven’t spoken exclusively about health… I don’t know what private conversations you have with people or what you want to reveal, but let me go to the record,’ Mr Shorten said. He then said Mr Morrison’s claim of a strong economy was a ‘classic Liberal strong economy’ based on ‘low wages’ and lack of investment in services. ‘You’re not answering the question Mr Shorten,’ Lea said. ‘Oh OK… I’m going to give someone else a go,’ Mr Shorten said in response, pointing to another reporter. ‘Answer the question, when can people know?’ Lea asked. ‘When can people know, the cost to the economy? You didn’t answer the question. ‘You should answer the question, that’s why we’re here to ask questions and you’re not answering the question. When can people expect to know, Mr Shorten, the cost to the economy? Mr Shorten refused to answer, and said he wanted to take questions from other reporters. 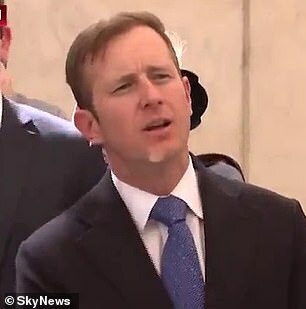 ‘Cos I’m going to give your colleagues half a go,’ Mr Shorten said in reply to Lea asking why he couldn’t give an answer to the query about the cost of the emission reduction target. Lea later tweeted about the fiery encounter with Mr Shorten. ‘Five times I asked Bill Shorten what the cost of his emissions reduction target would be to the economy? And when Australia would know,’ Lea said.